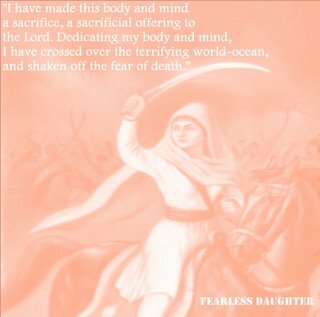 Daughters of the Khalsa: Mai Bhag Kaur Ji, How did it feel? Mai Bhag Kaur Ji, How did it feel? Mai, Mai, Mai Bhag Kaur Ji, how did it feel? Mai Bhag Kaur Ji, how did it feel to be a Khalsa woman? Mai, Mai, Mai Bhago, how did it feel? Devotee feels-- Without YOU fine quilts are just diseases pressing against the body, and our houses are just a pit of snakes. "...Nourish the Power of your Spirit...and your Dreams will Blossom..."